The bioavailability of zinc in poultry: what does literature say? Home Poultry Facts Feeding The bioavailability of zinc in poultry: what does literature say? Zinc bioavailability: zinc is an essential trace element for all the animals, including broilers. In case of deficiency, alteration of growth performance and distortion of the leg bones can be observed. 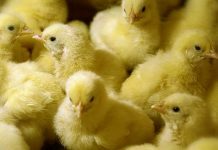 Supplementing broiler feeds with zinc is necessary in order to fulfil the requirements of the animal. Some zinc sources can be used, but they are not all equal. Physical and chemical properties, including zinc concentration, vary from one source to another. The effect of zinc supplementation on animal performance has been studied these last decades but the methodology to assess the bioavailability of Zn sources has made much progress these last years. As there is a need to reduce safety margin for mineral supplementation, a fine tuned definition of the performance of each zinc source is required. According to O’Dell (1997), the bioavailability of an element is “the proportion of the element consumed that is utilized for a biochemical or physiological function”. A part of the ingested elements is solubilised in the gastro-intestinal environment and consequently becomes absorbable across the enterocytes; these elements are termed ‘bioaccessible’. When the elements are not solubilised, they pass through the intestine and are excreted. Elements which are absorbed through the intestinal barrier and which reach the systemic circulation are bioavailable and can take part to specific functions in the animal organism. Comparing bioavailability of zinc sources is possible through some measurements in the animals. The zinc concentration in some organs and the activity of specific enzymes can provide a good indication concerning the bioavailability of dietary zinc. These parameters vary with the proportion of ingested zinc. The criteria to select as reliable biomarkers of zinc status can vary with the animal species. For example, a strong relationship exists between plasmatic alkaline phosphate activity and ingested zinc in pigs, but these variables seem independent in poultry. In monogastrics, zinc concentrations in the pancreas, kidney, liver and intestinal mucosa increase when dietary zinc increases. Metallothionein concentrations in soft tissues are also sometimes measured in bioavailability studies. But, in case of excess, zinc is stored before its excretion, so that zinc concentration and metallothionein level in these tissues are not necessarily bound to the proportion of zinc utilized for biochemical or physiological functions. In poultry and in pigs, a good correlation exists between dietary zinc at nutritional level and plasma zinc concentration. Bone zinc concentration is also a good criterion concerning the zinc status of the animal. When dietary zinc concentration clearly exceeds physiological requirements, blood and bone zinc concentrations reach a plateau. 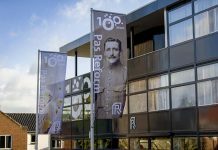 Other measurements are possible, like the immunological system’s response (thymus weight, spleen weight, IgA concentration, macrophages) and the quantification of gene expression (metallothionein, transporters ZnT), but their relevance has not be proven either. The interpretation of such biological markers can be misleading. 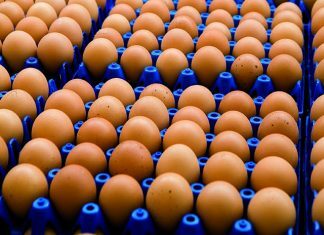 A few dozen of bioavailability studies were conducted in poultry during the past twenty five years. A literature review was prepared by selecting 37 of these studies, which evaluated the evolution of some physiological parameters according to the zinc concentration in the feed. In the field, the range for native zinc concentration in poultry diets is 25-45 ppm. As zinc requirement for broilers is estimated between 40 and 60 ppm by different scientific bodies (NRC, INRA), supplementing diets with zinc is necessary. In all trials, zinc concentration in basal diets varied between 1 and 100 ppm; zinc concentration in experimental diets ranged from 4 to 500 ppm. At 150 ppm, zinc level is twice or even three times higher than broiler requirement. Consequently, data over 150 ppm of zinc were not retained in our review: at this level, zinc is clearly supplied in excess, and changes in bone or in plasma are small or nul. 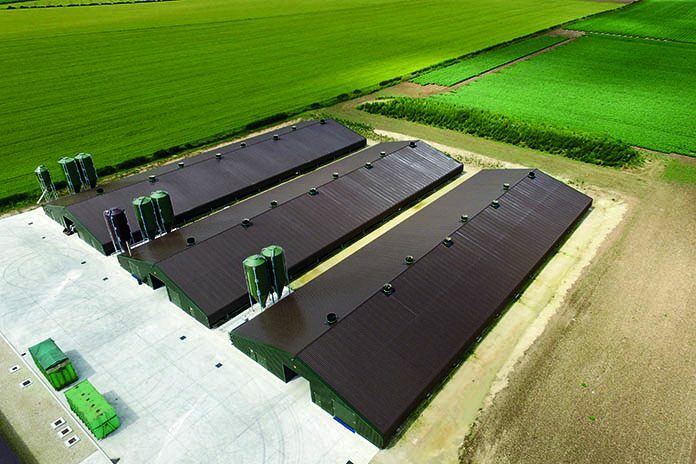 Studies used for this review were conducted in different countries (essentially United States of America, France and China) on some well-known broiler strains (Ross, Hampshire x Columbian, Abor Acres). In general, only male chicks were used. When both sexes were studied, only data from males were selected. Various parameters were used to evaluate zinc bioavailability: growth performance, zinc concentration in some organs, metallothionein concentration in some tissues, zinc balance (ingested zinc versus excreted zinc). Depending on the experiment, zinc concentration was measured in pancreas, liver, kidney, plasma and in some bones (tibia, toe, femur). For our review, only zinc concentrations in plasma and in the tibia were compared: these two biomarkers are the most relevant. In general, tibia zinc concentration was calculated on the basis of dry matter content; this basis was considered as the most appropriate. When zinc concentration was calculated on the basis of ash content, and when this content was not specified, ash content was estimated at around 500 g/kg of dry matter content. Zinc sulphate was generally used as a reference and represented by itself more than half of the measures. When comparing scientific literature, zinc concentration in bone was a more common criterion than zinc concentration in plasma. More than 50 measurements of zinc in the tibia were recorded in our literature review; only 20 measurements of zinc in plasma were available. A plateau could be observed for both criteria. Requirements in zinc are considered satisfied when zinc concentration does not increase any further in the bone or in the blood. 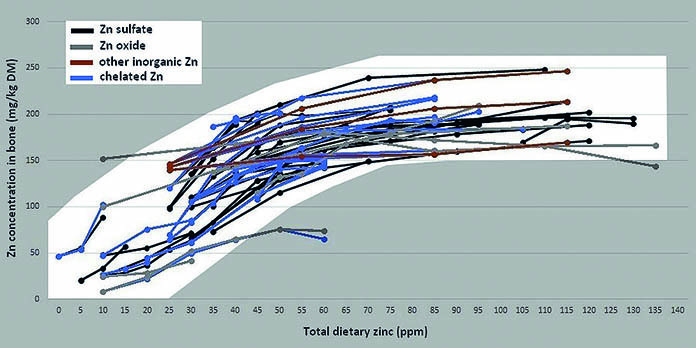 Plasma zinc concentration reaches a plateau when total dietary zinc is between 45 and 60 ppm (Figure 1). However the small number of measures does not permit a generalization of this conclusion. On the contrary, zinc concentration in the tibia was represented by a high number of points. All the curves followed the same direction, but the maximum Zn tibia concentration varied between 150 and 250 ppm (Figure 2). Maximum value seemed to be independent from the zinc source. It is difficult to determine when the plateau is reached, but it can be concluded that zinc requirements in broilers would be satisfied at 70 ppm. 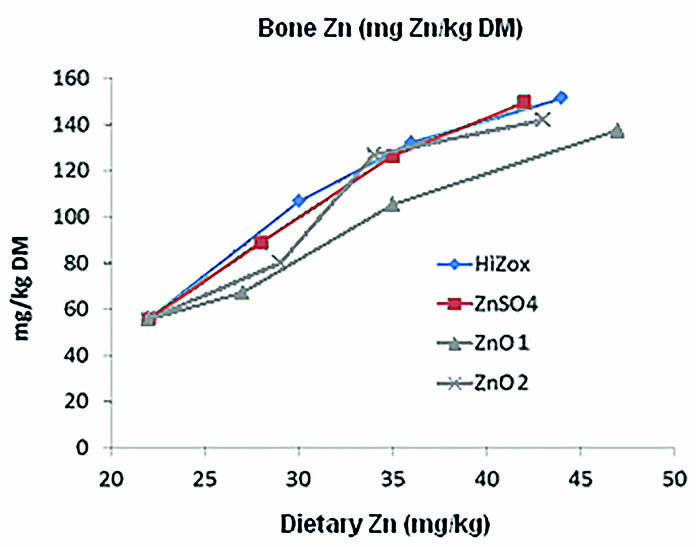 Zinc concentration in the bone is stable when total dietary zinc exceeds 70 ppm. There are very few data comparing inorganic zinc sources. 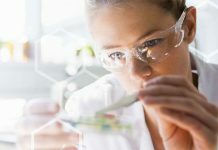 Generally, the chemical and physical description of tested products is scarce. Zinc oxide products showed a lower but highly variable bioavailability compared to the sulphate form. The lack of analytical method to characterise chelated products does not help for understanding. A recent meta-analysis showed that the bioavailability of chelated zinc sources and of zinc sulphate were similar in broilers. It is now a common practice to calculate the relative biological value (RBV) of zinc sources when assessing their bioavailability. RBV is estimated by using the slopes of the regression lines. When the RBV is high, the dietary zinc concentration, which is necessary to reach the plateau is low. Calculating RBV’s requires a strict methodology if robust conclusions are needed. For example, it implies that Zn dosages are tested below animal requirements. A study performed by INRA (National Institute of Agronomic Research, France) measured the bioavailability of four zinc sources: HiZox® (a potentiated zinc oxide from Animine) and two feed grade sources of zinc oxide collected from the market were compared to zinc sulphate. In this trial, 117 male broilers were fed in individual cages, from 5 to 21 days of age. 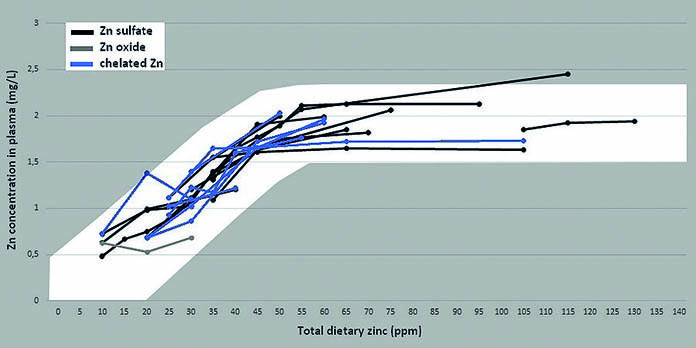 The basal diet contained 22 ppm of zinc and fulfilled other requirements of the animals; 12 other experimental diets were prepared by adding 7, 14 or 21 ppm of each zinc source. 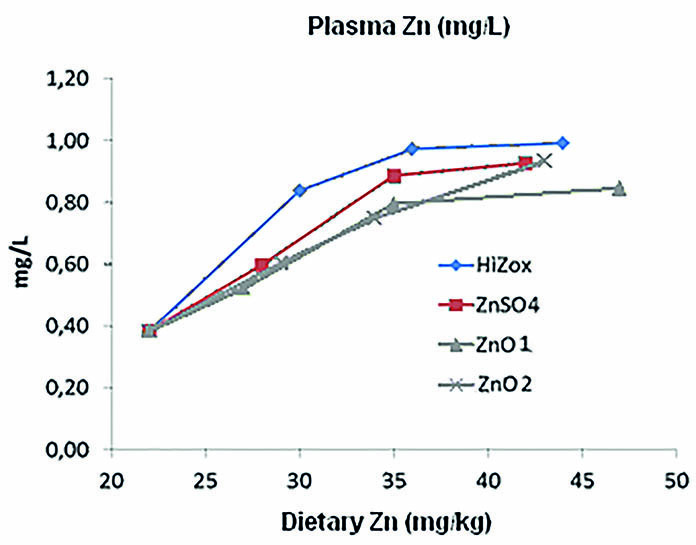 Zinc bioavailability was evaluated by measuring zinc concentration in plasma and in bone. Significant differences were observed on plasma and bone zinc concentrations: in the group fed the potentiated zinc oxide, the zinc level increased by 16 to 29% in the plasma (Figure 3) and by 7 to 26% in the bone (Figure 4), compared to the other groups. Calculated RBV confirmed that the bioavailability of HiZox® is not only higher than the bioavailability of other zinc oxide sources, but also than the bioavailability of zinc sulphate (Table 1). Sustainable animal production chains have to reduce safety margins between physiological requirements and excess zinc supplementation levels. Thus, nutritionists need to use feed grade zinc sources which are well characterised and with high bioavailability. Further research is still warranted to identify sensitive biomarkers of Zn status from birds under various nutritional and sanitary stress factors. List of Journals used for the literature review (title and years): Animal (2007, 2010, 2013) – Animal Feed Science and Technology (1999, 2002, 2013) – Annals of Biological Research (2012) – Biotechnology in Animal Husbandry (2012) – British Poultry Science (1999, 2003, 2004, 2007, 2011) – ESPN (2007) – International Journal of Poultry Science (2006) – Journal of Animal Science (1990, 1992, 1997, 1999, 2000, 2009) – Journal of Applied Poultry Research (2000, 2008, 2013) – Polish Journal of Food and Nutrition Sciences (2007) – Poultry Science (1991, 1993, 1996, 1998, 2001, 2007, 2009, 2012) – Revista Brasileira de Zootecnia (2008, 2009).